Galaxy Bath LTD 4 Brewery Mews Business Centre St. John`s Road Isleworth TW7 6PH. 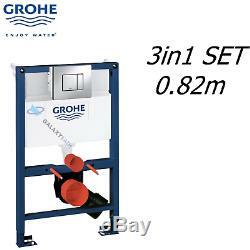 GROHE RAPID SL 82 WALL HUNG TOILET WC CONCEALED CISTERN FRAME 3IN1 SET. PRODUCT DESCRIPTION The GROHE Rapid SL 3 in 1 WC Set 38773 000 (38773000) is designed for concealed (in-wall or in-front-of-the-wall) installations with wall hung toilets and comprises: Rapid SL 0.82m WC Frame with Concealed Dual Flush Cistern (MPN 38526 001). Rapid SL Front Wall Brackets, pair (MPN 38558 00M). 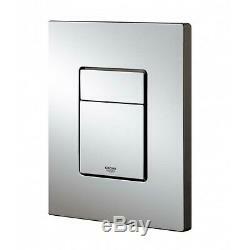 Skate Cosmopolitan WC Dual Flush Wall Plate, chrome plated (MPN 38732 000). The GROHE Rapid SL WC frame installation set boasts a wealth of versatile features, making it one of the most popular toilet frame systems. Whether you are planning a new project or modernising your existing bathroom, our Rapid SL frame system ensures hassle-free bathroom installation. The frame is simply secured in place during the construction or refurbishment of your bathroom and concealed behind a wall. The GROHE concealed cistern, fixed to the 0.82m installation frame, is unbelievably quiet and is fitted with Nova Cosmopolitan dual flush rectangular wall plate with round push-button allowing you to save water by flushing with a reduced water volume. The GROHE Rapid SL 3 in 1 WC Set 38773 features and specifications: Simple and hassle-free installation: Frame and cistern come completely pre-assembled with fixed connections. Rapid SL 0.82m WC Frame: Concealed installation: In-wall or in-front-of-the-wall (on-the-wall or studded walls). Can be used inside full- and mid-height partition walls. Frame load bearing capacity: Up to 400 kg. Installation height: 0.82 metre. Complete with 2 x WC pan fixing bolts, distance 180/230mm. Outlet bend: Ø80mm, complete with depth adjustable Ø80-100mm reducer. Material: Powder coated steel frame. Supplied with pair of front wall brackets. Concealed Cistern , 6-9 ltrs: Small access opening for maintenance. 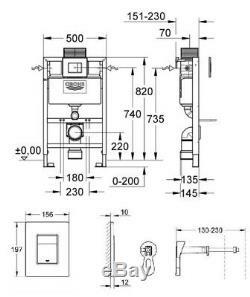 Pneumatic flush valve offering 3 modes of operation: Single non-interruptible flush (6 ltrs), dual flush (factory pre-set 6/3 ltrs, can be adjusted) or start/stop actuation (interrupted flush). Water supply from left/right or back. Complete with 1/2'' water supply connection including integrated angle valve and push-fit flexible hose union. Inlet and outlet connecting set supplied. Supplied with rectangular Skate Cosmopolitan Wall Plate , square dual push-button: Single flush, dual flush or start/stop actuation (interrupted flush): Depends on flush valve configuration. Easily removed to give access to the cistern. 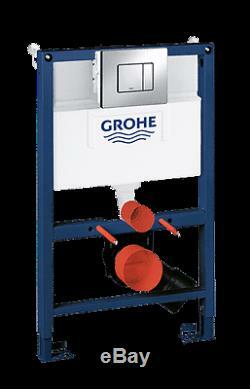 GROHE EcoJoy® technology for less water and perfect flow. GROHE StarLight® chrome finish: Resistant to scratches and tarnishing. Dimensions: 156mm x 197mm, horizontal projection 11mm. 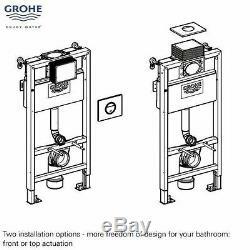 Complete Grohe Rapid SL 0.82m WC Toilet Cistern Frame MPN 38526001. 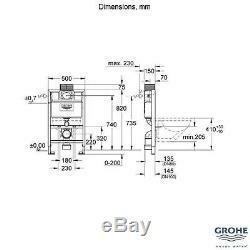 Grohe Skate Cosmopolitan Chrome Dual Flush Plate MPN 38732000. Grohe Wall Brackets MPN 3855800M. Apply only for orders placed by 1pm. The item "GROHE RAPID SL 82 WALL HUNG TOILET WC CONCEALED CISTERN FRAME 3IN1 SET" is in sale since Tuesday, January 22, 2019.